Carmen, both a versatile designer and cabinetmaker, has won several national awards for high-end custom kitchens. Anna Maria is an interior designer as well, and puts the finishing touches on Carmen’s masterpieces. The husband and wife team has achieved much success over the years and have been recognized in several publications such as WoodShop News and featured in a series produced by Analog Watch Co. called Hands On, which is dedicated to honoring the people, machines, and processes involved in making and manufacturing. PIDC assisted Carmana Designs with several projects including the purchase of a new building, and machinery and equipment in order to expand their business. We were excited to have Anna Maria share her story here. Describe your business for our readers. Anna Maria – We are a full-service boutique millshop and high-end custom cabinetmaking firm located in the funky new South Philadelphia neighborhood of Newbold, with our facility encompassing over 40,000 square feet and the footprint of an entire city block. We design, fabricate, finish and install high-end, high-quality commercial and residential custom cabinets and millwork. With over $2 million in computerized, specialized woodworking machinery hailing from Germany and Italy, we also have one of the largest downdraft paint booths on the east coast. 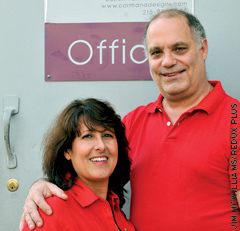 Who are some of the clients Carmana Designs, Ltd. has worked with? Anna Maria– We do work for commercial clients such as boutiques, retail stores, hotels, offices, restaurants and cafes, with much of it being done “private label”, with some of it for Fortune 500 companies is shipped world-wide. With residential, we engage the homeowner in effective space planning and then design, fabricate and install cabinetry and millwork such as entertainment and shelving units, bath vanities, and built-in cabinetry, specializing in signature contemporary kitchens with high-gloss finishes over exotic wood veneers. We are very proud and it is very gratifying that we can take something from a conceptual to an actual finished, tangible product, which is not something that too many corporations can say they do these days. We have done work for some high-profile Philadelphians, including a 10,000 square foot kitchen in Moorestown, NJ for Shirley and Vernon Hill, founders of the former Commerce Bank, now TD. We’ve done some interesting work for 76’ers great “Dr. J”, Julius Erving, former Eagles player Keith Byars and some high-profile lawyers, doctors and surgeons. We collaborate with a variety of interior designers and sometimes do a home with custom cabinetry from top to bottom. Over the past 32 years, we’ve done some interesting conceptual work for X-Box and Hollister and have done extensive visual merchandising for Macy’s all across the country. The most unusual thing we have ever done was design and build a $25,000 wet bar for a client in Nigeria. We had to crate it in a shipping container and the ship line came to pick it up with a crane. Anna Maria– We never flat-out said, “Let’s become entrepreneurs”, it just kind of evolved. My husband, Carmen, learned everything he could from my godfather, who was an “Old-World” master cabinetmaker (now this is becoming the “Godfather” story!). When he couldn’t learn any further, he decided to go out on his own. We thrived because we heavily invested in and embraced cutting-edge technology. We enjoy the independence and autonomy that entrepreneurship brings and would never go back. Did you know anything about PIDC before you became a client? Anna Maria– We didn’t know too much about PIDC, but we sure learned the ropes pretty fast! I do enjoy the PIDC monthly e-newsletters – it is a great way to stay informed on all the great and exciting things going on in Philadelphia right now. Being a neighbor of The Navy Yard, and being high-end kitchen and bath designers, we frequently attend design events at Fretz Corporation’s gorgeous, state-of-the-art headquarters at The Navy Yard. What has financing from PIDC allowed you to accomplish with your business? Anna Maria– The financing from PIDC allowed us to grow our business from 8,000 square feet that was a combination of owned and rented spaces to the purchase of an enormous 40,000+ square foot facility. When we purchased the buildings we had to completely renovate all the systems. The buildings were raining inside, had ancient electrical wiring systems which had to be ripped out, no plumbing, no HVAC, no nothing – essentially just a shell of a space. It took us an entire year to renovate the building, insulating it extensively, installing new roofs, radiant heating, a three-phase electrical system, extensive dust collection and air compression systems and a state-of-the-art downdraft paint booth with a million BTU’s of natural gas which gives us the opportunity to properly cure our catalyzed urethane and polyester finishes very quickly. PIDC’s financing also enabled us to invest heavily in computerized woodworking machinery, such as a custom-made CNC router. What are some of the ways you give back to the community? Anna Maria– We enjoy “paying it forward” and stewarding the upcoming generation to explore careers in manufacturing. Over the years, we have taught scores of young men the ropes of cabinetmaking and carpentry. We have taken under our wing countless interns, have hosted many schools with tours through our facility and have volunteered our time with area schools by speaking at Career Day programs and lending our experience at resume and interviewing workshops. We are partnering with area organizations such as Manufacturing Alliance of Philadelphia (MAP), who is initiating an exciting, new partnership between local manufacturer members and the Philadelphia School District to inspire students to consider a career in manufacturing. One of my husband’s greatest memories is that he watched a young man sweeping the floor at McDonald’s and offered him a job because he was impressed by the young man’s chutzpah. He accepted the position, took him under our wing, and in time, not only learned to be a master cabinetmaking, but he became the foreman of our shop for years. 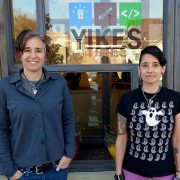 What’s your take on Philadelphia’s current entrepreneur scene? Anna Maria– Philadelphia’s entrepreneur scene has really blossomed in recent years. I am regularly fascinated at how the younger generations keep coming up with new paradigms by spinning old-fashioned things in a new way. I regularly read blogs such as Naked Philly and Passyunk Post to keep me informed about the dynamic and creative spirit infusing Philadelphia’s real estate, restaurant, cultural and business communities. Just the explosion of Philadelphia’s restaurant scene alone has created enormous sources of tax revenue for Philadelphia, new job growth and increased business for collateral businesses such as ours. What happened at The Navy Yard truly gladdens my soul, as it has been a joyous transformation, and makes us so proud to be native Philadelphians right now. Public-private partnerships and stewardships, when done right, like it is with PIDC, are just great for the overall business complexion of a metropolis like Philadelphia. Every investor and stakeholder strengthens the bonds for every other business owner. Do you have any advice for other small business owners? 1. As long as two people agree on something, anything can be negotiated and any deal can be made. Be creative with deal-making by asking for what you want, no matter how high the stakes. Also be prepared to walk away from the deal and mean it. You will invariably get what you want. 2. Ask for what you want – if you never have the guts to ask for something, you’ll never get it! 3. The entrepreneur takes all the risks; therefore they get to enjoy the rewards. When you hear the distant thunder of negativity or envy from others, keep reminding yourself that you were bold enough to take the risks so you shouldn’t feel guilty enjoying the rewards. https://pidcphilablog.com/wp-content/uploads/2019/02/logo-pidc-phila-blog.jpg 0 0 PIDCphila https://pidcphilablog.com/wp-content/uploads/2019/02/logo-pidc-phila-blog.jpg PIDCphila2014-09-11 19:11:152017-02-09 23:37:01A LOOK INSIDE PIDC CLIENT CARMANA DESIGNS, LTD.